Detroit, 1837-1847. 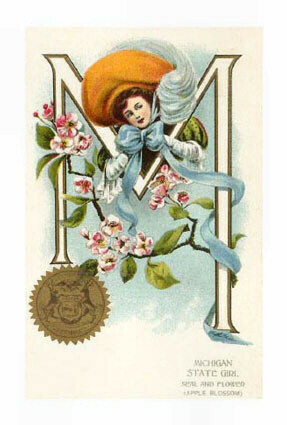 Lansing, since 1847. January 26, 1837, 26th State. Michigan Geography, 96,810 square miles. 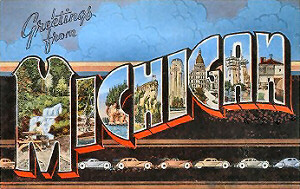 Border States: Michigan is a unique state in that it consists of two separate peninsulas into the Great Lakes. 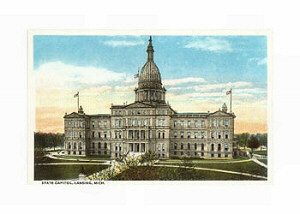 Constitution: Michigan Constitution, 26th state to enter the Union. Manufacturing: Transportation equipment (automobiles, trucks, vans, SUVs, airplanes, boats, buses) is Michigan's most valuable manufacturing sector. Production of machinery (bearings, chisels, dies, valves, machine parts, computers, conveyors, engines, machine tools, pumps) is the state's second-ranked sector. Fabricated metal products (cutlery, hand tools, hardware) rank third in Michigan. The state is among the leading states in the manufacture of sporting goods and athletic equipment. Services: Community, business and personal services (private health care, law offices, engineering and research companies, repair shops, computer software companies) is the leading service industry in Michigan. Ranking second is the wholesale (automobiles, automobile parts, groceries, machinery) and retail (automobile dealerships, discount stores, grocery stores, restaurants) trade sector. Michigan's third-ranking service industry is finance, real estate and insurance. 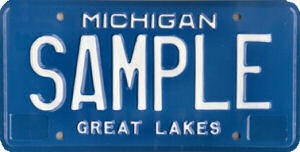 Mining: Michigan's most important mined products are natural gas, iron ore and petroleum. Michigan ranks second, behind Minnesota, in the production of iron ore and one of the world's largest limestone quarries in located in Michigan. The state is the leading producer of iron oxide pigments and magnesium compounds in the country and is among the leaders in the production of gypsum, iodine, peat and sand and gravel. Large deposits of copper exist in the state but are expensive to mine. Fishing: As one would expect, most of Michigan's fish catch is taken from the Great Lakes. The most important fishes are catfish, chubs, lake herring, lake trout, salmon, whitefish and yellow perch. Each spring smelts are harvested from the state's rivers and streams. Highest Point: Mount Arvon, 1,979 feet above sea level. Lowest Point: Lake Erie, 572 feet above sea level. Natural Resources: Michigan is a state very rich in natural resources with fertile soils, rich mineral deposits (iron ore, copper, petroleum, natural gas, salt, limestone, shale, gypsum, sand and gravel), widespread forests, plentiful water and abundant plant and animal life. Michigan House: Find Your Representative. Michigan Senate: Find Your Senator.